When I began eating a plant-based diet, candy seemed like one of those foods that I’d never have to worry about. I never even thought to check the ingredient lists of candy packages to see if they contained animal products. What animal ingredients could possibly be used in the making of candy?! Turns out, a lot. There are many obscure animal products used in a wide variety of edibles out there — gelatin being the most common. 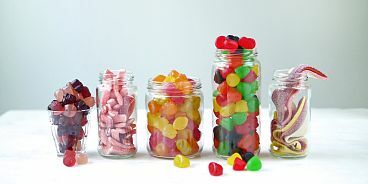 Gelatin is derived from collagen, which is obtained from the skin, bones and connective tissues of animals like cows, chickens, pigs and fish. Pig skin is the main source of gelatin found in desserts. For those turned off by the thought of this, there are fortunately lots of vegan candies on the market! 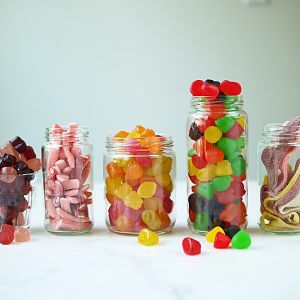 One of the most easily accessible brands with gelatin-free sweets in their line-up is Dare Candy Co., whose products can be found at most major retailers. This makes stocking up for camping trips, movie nights and treat occasions too easy! View all Dare’s gelatin-free candies here (look for the gelatin free logo). I find these hard to keep these in the house because once I start, it’s tough to stop. They are are addictive. I love when the bag has just been cracked and they’re super soft and fresh. 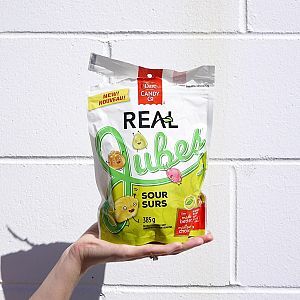 I’m a sucker for sours, so my favourites (it’s a three-way tie) are Dare’s Realsour Strips, the Realsour Sticks and the Realjubes Sour. I’m salivating just thinking about them. If faced with a blind candy taste test, there is no way — not in a million years — that I could ever tell the difference between candies made with gelatin and those with the plant-based substitute, cornstarch. No reason not to choose the latter. Dare’s candies are also gluten free, peanut free and made without artificial colours or flavours. Find them at most major retailers, like London Drugs, Save-on Foods and Canadian Superstore and make sure to look for the yellow and green ‘gelatin-free’ logo on the front of the package. Thanks so much for Dare Candy Co. for sponsoring this post! All opinions are my own.